Haridwar and Rishikesh. One of the twin pilgrimages of Uttaranchal, which I have been longing to visit since childhood. The other two being Badrinath, Kedarnath and Gangotri, Yamnotri which I’m sure I’ll visit before I leave Lucknow. For me, who was in North India for the first time (Trust me, never been here even in dreams) my adrenaline was high. It all started off with me not being able to go home for the vacation, and deciding to join my friends (who had already planned everything) in the last minute. Thanks to Lalooji for his tatkal scheme, I got my travel tickets confirmed then and there. The morning when we landed at Haridwar Junction, the atmosphere was rocking. We could feel water droplets challenging us in the cold breeze. Winning against the feiry might of the dew, we left for the bank of the river Ganges, to test ourselves against the river. The place was "Har Ki Pauri" meaning ‘footsteps of the lord’ (this is supposed to be one of the four places where drops of Amrit the elixir of immortality accidentally spilled over from the pitcher when Garuda, the celestial bird was carrying it after the Samudramanthan). Then we visited the Mansa Devi temple on the hill. 40 bucks and 5 minutes, we were there via a ropeway. One can’t miss the picturesque scenery of Haridwar from the ropecar. More friends joined us from Delhi and all of us reached ‘Har Ki Pauri’ again. After a dip in the Ganges (to remove all our sins J) and a delicious lunch at the Ginger hotel we got back to a place on the other side of Har Ki Pauri where a huge statue of Lord Shiva stands, welcoming Mother Ganges into Haridwar. A little ahead of it, stands the Bhimgoda Barrage where 2 of us went to the sink side of the barrage and stayed for a couple of hours (I’d not be writing this had the barage gates been opened when we were on that side ). The only regret was that we missed the Har Ki Pauri Aarti in the evening though we could just get a glimpse of it from the auto on our way to Rishikesh. Two tiresome hours, and we reached Hotel Green View, Rishikesh. We had to search for food at 8.30 as the day ended for most of the restaurants by then. A walk alongside the fiery Ganges after a sumptuous dinner got us back to our rooms. The next morning, all my friends were packed up for their White Water Rafting trip when I had to stay back (due to ill health). I opened the curtains of my room and was just mesmerized by the view and then realized the hotel was actually not a misnomer. The fog and the clouds were engaged in a duel to decide who would blanket the mighty hills, however, the clouds emerged victorious by afternoon. In Rishikesh, if you would throw a stone up in the air, I’m sure it’d land on to a temple or a foreigner. Rishikesh seems to me, averse to Triskaidekaphobia (Don’t ask me what this is). Most of the big temples there are (just) 13 storied. Two such temples are just at the entrance to Lakshman Jhula, and one of them contains miniatures of all the deities of all the famous temples of India. Another such temple is half way uphill on one of the hills in Rishikesh. This is the famous Bhootnath Mandir. The top most floor contains a very beautiful idol of Lord Bhootnath (Lord Shiva), which is just a treat to the eyes. The Chhotiwalas restaurant is one very nice place there, both the food and ambience. The last day was a trip to Neelkanth Mandir atop a hill. It’s around 20 km by road. A very thin ghat road with a deep valley on one side where one can see the fierce white waters of the Ganges and the lofty cliffs on the other side. To add to the fright, that was a two-way road. May God bless the Uttarakhand Government for not allowing the buses on those roads! The jeeps there run at very high speeds and the drivers probably think they are playing ‘Need for Speed’ on a ‘Playstation’. The Shraddhashram is another notable place on the bank of the Ganges. A nice place to visit, it hosts an orphanage, an old age home, and above all, a beautiful temple of Lord Krishna. At its entry, lies a retail shop of the Gita Press – Gorakhpur, where I purchased a mink blanket for myself. Opposite to this, the ghat called Parmarth Niketan, hosts a beautiful white statue of Lord Shiva (made of Plaster Of Paris). Last but not the least, It would be a sin if I don’t mention those beautiful foreigners on the streets of Rishikesh, who have come in search of spiritual knowledge (Hats off to their persistence and interest). Finally, all I would say is just be careful not to get deceived while travelling or shopping (Go for the best bargain J). Do stay in Hotel Green View (I’m not endorsing it). Don’t miss out going to Chhotiwalas (U’ll know why). With this, signing off… Hoping to get back to u with another one soon. A great travelogue, both informative and funny. Keep it up and you have loads of writing skills. 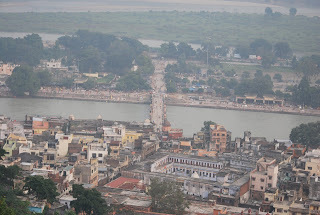 Haridwar is a beautiful city and Har ki Pauri is a nice place to visit. I especially lovedits atmosphere at night. I though loved the temple of Mansadevi the most. The views from the top are enchanting.